It was some 25 years ago that a new star would rise in the lighting tower sector, and it would take the whole concept of on-site illumination to a new level. Since the launch of the first TL90, SMC has become the UK’s leading manufacturer in the field, and those subsequent years of customer feedback and design optimisation have directly led to the TL90 Evolve. The contemporary and modern look of this latest incarnation is complemented by a unit that provides significant return on investment for hirers, and the benefits don’t end there. A mammoth 185 hours of run time, quieter operation and cheaper service and maintenance costs all add to that appeal, but there are also a number of options to choose from. The SMC brand is currently celebrating 25 years of manufacturing in the UK, and over that time has developed a considerable stock of experience in what the industry requires. That’s why there are now three different lighting options available, starting with the standard and energy saving four LED heads. 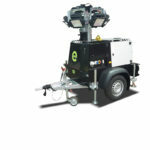 If you’re searching for a more powerful array then the six head would be your solution, offering a light output of 217,500 lumens, whilst Evolve is also available with the unique Halo anti-glare lighting array, which reduces the single focal point and is an advantage in applications on roadsides or motorway projects. The Halo will deliver a site an improved light spread and above average lux levels compared to a conventional LED or Metal Halide lamp. It is more robust than conventional lights, a particular consideration in the rental market, and has been designed for simple deployment with no lamp adjustment. Just as the original TL90 was ahead of its time, Morris Site Machinery also saw the potential of zero emissions and zero noise solar lighting early, and would launch its first unit some 10 years ago. Indeed, the TL55 can still boast the longest runtime – with its 4, 55W LED lamps powered for up to 500 hours on battery, and an unlimited period on solar power – whilst the units are largely maintenance free, extending service intervals and costs. The introduction of the TL60 Solar Trolley extends the reach of renewable energy technology in lighting towers still further. Weighing just 230kg, for instance, this is a highly manoeuvrable piece of equipment, which can be transported in a pick-up or van, and will fit through a standard doorway. 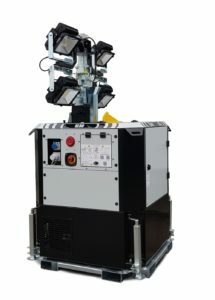 In addition, an in-built sensor means light is emitted when needed, saving battery power and eliminating the need for a site operative to switch the machine on and off. Whilst engine emissions have precipitated swathes of legislation over many years, and noise pollution has shifted up the public spectrum of anxiety, light pollution is now equally coming up the scale in the public consciousness, particularly in a residential context. With contractors increasingly under pressure to prove not just their sustainability credentials, but also their consideration to the local community, choosing machinery and equipment that has minimal impact, especially on brownfield sites, is now imperative. That’s why end users have again been empowered to choose different LED floodlight arrangements, including dimmable lights, auto timer and PIR control. 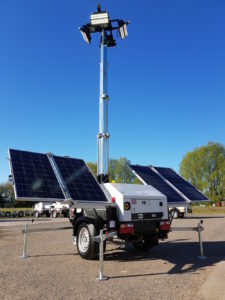 Another addition that should inspire considerable interest for those in the market for renewable energy options is the SL80 Pallet, a static, eight metre mast unit, with a 355 degree mast rotation. Its four 300W LEDs benefit from a runtime of up to 265 hours, emitting over 130,000 lumens over that time. As with any solar unit super silent operation is inherent to the concept but, with 22 units fitting on a Euro trailer, SMC has also answered the demands of efficient transportation.